Sharps Compliance, Inc. Sharps Disposal Recovery System for Needles, Sharps Compliance, Inc. Sharps TakeAway Environmental Return System for Sharps. Sharps Containers, manufactured by Sharps Compliance, Inc., are highly durable and available in an assortment of configurations and designs. You may select a Sharps Compliance, Inc. Sharps Container to properly and safely dispose of needles or other sharp instruments. Sharps Compliance, Inc. is a recognized manufacturer and produces the popular Sharps Container Recovery System. 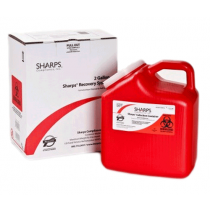 Simplifying the management of bio hazardous waste, Sharps Compliance, Inc., sends you a pre-paid return shipping box for you to return your filled sharps container with your purchase of a sharps container. The Sharps Container Recovery System is approved for returns in all 50 states and US territories by USPS. 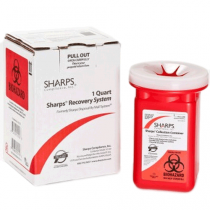 This will save you time, money, and energy when needing to properly dispose of your sharps. In addition to Sharps Compliance, Inc. being a leading manufacturer of sharps containers, Sharps Compliance, Inc. also creates its containers to meet or exceed OSHA Standards. 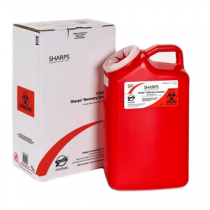 A Sharps Compliance, Inc. Sharps Container is easily identifiable, as each container is brightly colored red with a large biohazard symbol. 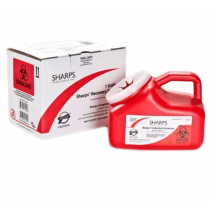 Buy your Sharps Compliance, Inc. Sharps Container to effectively and efficiently contain hazardous waste at a discounted rate today!